PKC-Alpha antibody LS-C17431 is an unconjugated rabbit polyclonal antibody to human PKC-Alpha (PRKCA). Validated for ELISA, IHC and WB. Synthetic peptide corresponding to a distinct C terminal region, (FEKAKLGPAGNKVISPEDRKQ residues 305-325) from human protein kinase C alpha. Percent identity by BLAST analysis: Elephant (95%); Marmoset, Platypus (90%); Turkey, Chicken (86%); Opossum, Xenopus (81%). Based on known homologies, it is expected to react with the PKC ortholog in most mammalian species. 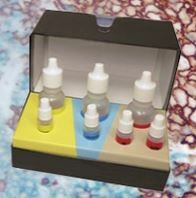 Suitable for use in Western blots, ELISA, and/or Immunohistochemical techniques. For Immunohistochemistry and Western blotting using alkaline phosphatase or HRP, a dilution of 1:250 is recommended. With a more sensitive detection system, such as enhanced chemiluminescence or ELISA, the antibody may be diluted further. Optimum dilutions to be determined by researcher.